Chinese Dance/Bollywood Dance/Belly Dance for Your Event! Are you looking to wow your guests with a magical dance performance? Well, you’ve come to the right place. We, at Lion Dance Singapore, don’t think of dance as just another art form. To us, it is so much more than that. Our lives, souls are and will always be tied to dancing. That’s how dedicated we are. We have spent countless hours perfecting our craft so that you do not need to worry about entertaining your guests. Our extensive rehearsal, attention to detail will surely leave them spellbound. Our cultural dance performances cover three genres- Bollywood dance, Chinese fan dance, and Belly dance. And we are proud to say that all our dancers are highly dedicated and well-trained in their respective dance forms. Each Bollywood dance routine usually lasts around 5 – 10 minutes and feature about 6 – 8 dancers. You can expect a fun, vibrant experience, just like the Bollywood industry itself. If you’re looking for a traditional Chinese experience, our thousand hands dance performance should have you covered. We perform multiple types of traditional dance forms, including the highly famous Lion Dance. And as you can see, the name of our group is inspired by that very dance form. Apart from the Lion Dance, we also provide a full authentic traditional Chinese dancing experience. We ensure that our performing group consists of 6 – 8 dancers as these numbers are believed to bring good fortune in the Chinese culture. Finally, if you want an authentic experience from the Middle-east, you should surely check out our Belly dance performances. Our head choreographer, with her extensive knowledge and experience, has created a team of dancers who specialize in multiple forms of belly dancing. Our belly dance performances cover forms like Iraqi dance, Raqs Dance, and Dabke to suit all tastes. Why Choose Us Over Other Performers? We take all our dance performances very seriously. While other dance troupes may send over YouTube videos to their supposed dancers for rehearsal, we ensure that all the performing artists are well trained and prepared for the show. We have specialist dancers who are experts in their respective dance form, be it Bollywood, Chinese, or Belly dancing. And that’s not all. Having performed in many events throughout Singapore, we now have a wealth of experience when it comes to live performances. And we are always prepared, no matter how large the audience. On top of that, we don’t need any special staging. Our dancers can perform almost anywhere. Weddings, birthdays, a private celebration at a restaurant, or even your company office, we can deliver a mesmerizing performance anywhere! Kate is a leading exponent of multidisciplinary dance forms in Asia. She draws inspiration namely from Bollywood Dance, Chinese Dance, Indian Dance and Belly Dance. Her performance pieces has brought Singapore dancers to international and regional audiences. Shortly after graduation from the National University of Singapore with BA(HON) in Theatre Studies, the TV series Kate acted in clinched the Gold World Medal (Television Programming and Promotion) in New York Festivals. She and her team also took home Best Acting Ensemble in our 48 Hour Film Festival. Other international appearances include American hit reality series, The Amazing Race, and Spanish reality series, Pekin Express. One of the world’s most historic and traditional dances, Chinese dancing is well over 3000 years old as evidenced from ancient pottery discovered from this time depicting people dancing in a line. In the 20th century the communist party reinvigorated this art form to try and rally their support in rural villages. This artistic evolution continues today as China reasserts itself as an economic powerhouse and with renewed interest in all its art forms around the world. The modern version of Chinese dancing consists of carefully choreographed groups of traditionally dressed female performers dancing to the instantly recognisable backing music containing traditional Chinese vocals. This style of dance was used extensively in ceremonies for the 2008 Beijing Olympics, which stunned audiences and helped spread word of this beautiful art form around the world. In China itself, dance features prominently on television and in theatre. Singapore, of course, has strong Chinese roots going right back to its foundation and today’s thriving Chinese community is a bedrock of its modern success. We are proud to showcase this beautiful form of dancing to celebrate this integral part of Chinese heritage. As you may have noticed, we have named our business as a tribute to a specific kind of Chinese dance, the Lion Dance, which we are proud to perform to audiences throughout Singapore and which you can read more about here. We offer the full authentic traditional Chinese dancing experience like you would find at any of the finest cultural events or most prestigious theatres in China. We are mindful of using groups of 6 or 8 dancers to bring good fortune to our guests as is believed in Chinese culture. Our graceful performers wear beautifully designed costumes, authentic make up, and will give you a splendid rendition of this piece of rich Chinese heritage. China now forms increasingly important partnerships across the globe in business with Singapore being a key location. Our dances are always immensely popular with western guests as they pay tribute to Chinese culture and serve as a reminder of home for our Chinese community. Popular Chinese dance performances includes fan dance, thousand hand dance performance and ribbon dance. Our performances are perfect to wow your guests at dinners with an oriental theme and we can also put on a spectacular show for Chinese New Year, which we have become renowned for here in Singapore. In Chinese culture, the fan dance is a symbolism of grace, beauty and delicacy- traditional values embodied by woman in China. Despite being one of the many folk dance performances in China, fan dance performance in Singapore is preserved to showcase the oriental culture and beauty of the Chinese civilization. The fan dance is composed of constantly changing rhythms paired with roving body movements. Father fans and silk both are part of the traditional Chinese dance that has its roots in the Han Dynasty, since 206 BC. Fans are used to highlight the graceful movements of the dancers and as extensions of very delicate poses. They can be used as a visual prop. The fans are made of a variety of materials including feathers, paper or bamboo and they reflect the highest level of craftsmanship and artistry. Well known for being the largest film industry in the world, twice as large as Hollywood in the USA, Indian movies have their own unique look and style. Famous for their large-scale routines complete with huge choreographed displays of dancers and singers. Video clips of such displays of Bollywood dancers regularly go viral helping spread this fun, wholesome, family entertainment around the world and making it as synonymous with India and Indian culture as the Taj Mahal. Music and film are intertwined in Indian cinema with a movie’s music known to make or break it at the box office. Modern Bollywood dancing usually tells a story and is a mix of western and traditional classical Indian styles, such as Hindi dance and Indian Folk dance. Ethnic Indians make up a small part of cosmopolitan Singapore’s permanent population, and we at Lion Dance Singapore are proud to showcase this modern, fun piece of Indian culture. The fact that it is less well known in our great city will make your event unlike any other and provide a unique experience for your guests. 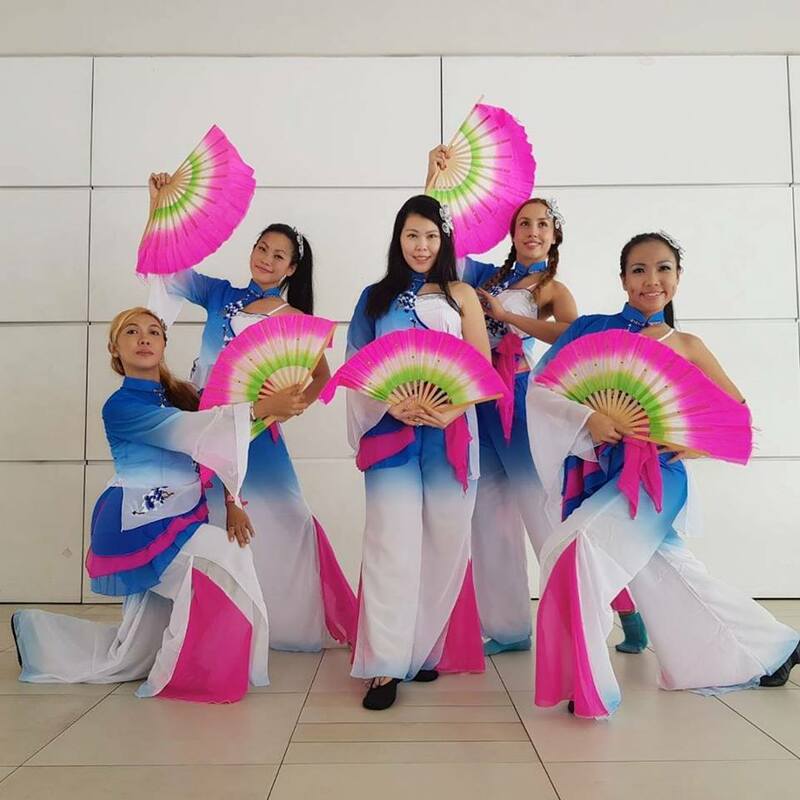 Our routines typically last around 5-10 minutes and usually feature 6-8 dancers ensuring a fun, vibrant event which is unlike anything else in Singapore and could be perfect as part of your corporate entertainment. If you wish to celebrate Hindi culture or for any religious events then our experienced and skilled Bollywood dancers and organisers will provide you with a dazzling live performance just like you see on the big screen. Belly dancing is the westernised name given to a traditional Middle Eastern dance dating from 19th century Egypt. Initially only performed by men, as it was seen as improper for ladies to perform, it is now famously performed by skilled female dancers and can hypnotise and be used to tempt men including the suave and sophisticated fictional British spy James Bond in both From Russia with Love and The Man with The Golden Gun. The dance caused moral outrage when it was first performed outside of its Middle Eastern origin, the notoriety of the seductive gyrations of the dancers’ hips helped it spread like wildfire. However what is commonly known as Belly Dancing around the world is actually only one type of dance. Our knowledgeable and qualified head choreographer has extensive experience and formal training and can arrange specific distinct forms such as Iraqi Dance, Raqs Dance, and Dabke each complete with its own unique style of music. Our attention to detail continues to be evident in our dancers’ attire, which include famous ‘Bedlah’ suit, and each distinct dance style has its own props and costumes. Our dancers come from all ethnicities and backgrounds and should you wish we can provide darker-skinned performers to provide you with a more authentic Middle Eastern experience. Here at Lion Dance Singapore, we pride ourselves on providing an authentic, sensual dance and our seductive dancers combine tradition with flirty fun to liven up any celebration such as a corporate dinner or Arabian themed night. The famous hypnotic hip gyrations and graceful movements of our dancers along with frequent audience interaction are extremely popular among our clients. In general each performance lasts for approximately 10 minutes and as an added bonus we don’t require any special staging. We can perform almost anywhere making it perfect for a celebration at a restaurant, a Middle Eastern or Indian wedding, birthday celebration, or at even at your company’s office.